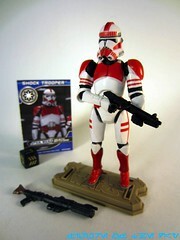 Commentary: This Shock Trooper is, more or less, a rerelease of a 2005 figure with improved deco. It's a little brighter, a little sharper, and lacking literally one accessory from the original release. The original 2005 figure had two different shoulder symbols which could be exchanged/lost, one was solid red plastic and the other had an Empire symbol on it. (The card has a Republic symbol.) The blank one was left out. The figure is basically the same mold, with a nifty quick-draw figure. If you squeeze his legs, his right arm pops up to draw his gun, adding some action to this figure. An "action figure," if you will. The figure has 13 joints, lacking a waist joint due to the action mechanism. It stands well, sits well, and is quite poseable. The red markings are a smidgen different from the previous release, but not significantly so. I'd say any version is OK if you're after a Quick-Draw Shock Trooper, as this one keeps the brown "wood" element on the longer rifle. We've had more articulated Shock Troopers in 2012 in our beloved Vintage Collection, but this one is still pretty nice. The helmet is good, the proportions are decent (if the shoulders are spread out a bit), and it's quite clean. Oh, and they painted the bottom of the boots. That's a plus. I like this figure, but I wouldn't necessarily suggest it's a required purchase unless you missed previous versions of this clone mold. Collector's Notes: None of the Movie Heroes from the first wave were particularly rare. You can probably score this one easily, and I would wager you'll get a crack at it very cheap at some point in the coming year. It's nice. I liked it better at $5.24 in 2005, today it's kind of pricey for what it is given how many cracks we had at it. A nearly identical figure was sold in 2005 on Revenge of the Sith packaging, in 2006's Episode III Greatest Battles subset of The Saga Collection, and I'm no doubt forgetting one somewhere. Other Shock Troopers were made using other Clone Trooper molds as a base.